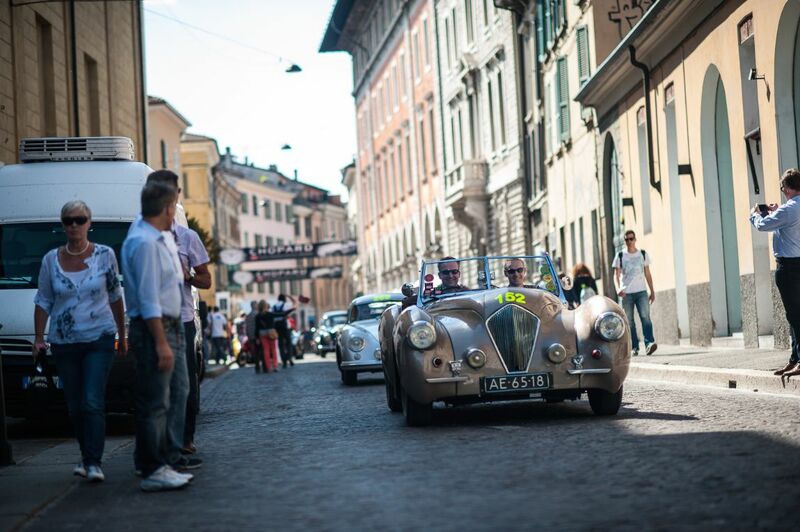 The Mille Miglia 2014 was held 15-18 May over 1,600 km of Italy’s most beautiful regions, starting and ending in Brescia. 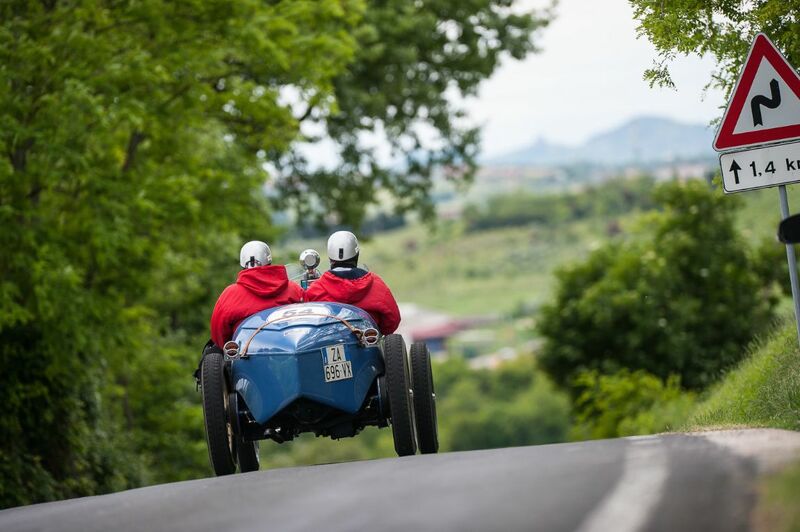 This year’s 1000 Miglia took participants along a breathtaking ride between historic villages, following an itinerary which although featuring some variations with respect to the previous editions, kept with the tracks of the twenty-four editions held from 1927 to 1957. The field of 435 cars — selected from 619 applicants — represented 35 countries across five continents, with 62 teams composed of members of the same family. The cars that lined up at the start in Viale Venezia on the evening of Thursday 16 May belonged to 61 different marques, the lions’ share being that of Mercedes-Benz with 45 cars and Alfa Romeo with 41, followed by FIAT with 39, Jaguar/SS with 31 and Porsche with 24 cars. 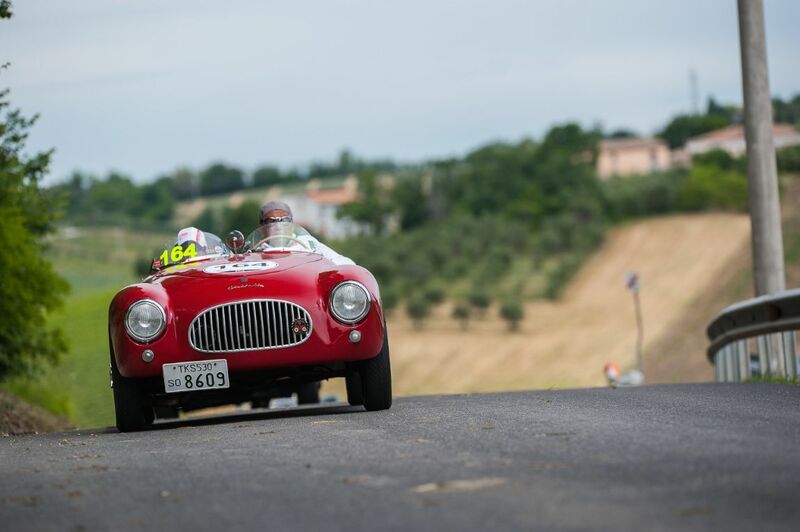 Participation in the Mille Miglia is limited to makes and models of cars, manufactured between 1927 and 1957, that took part in at least one of the original Mille Miglia races. 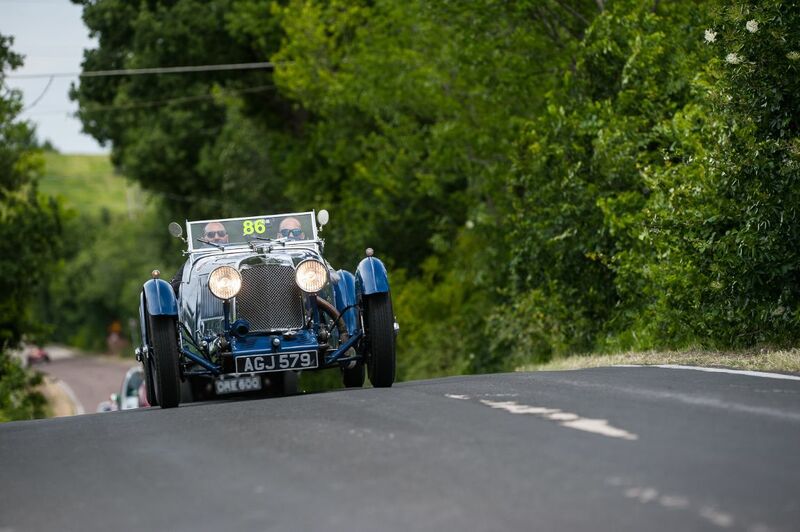 As is the tradition, the first cars to start the 2014 Mille Miglia were the OMs, the make of car that won the first of Brescia Mille Miglia in 1927. 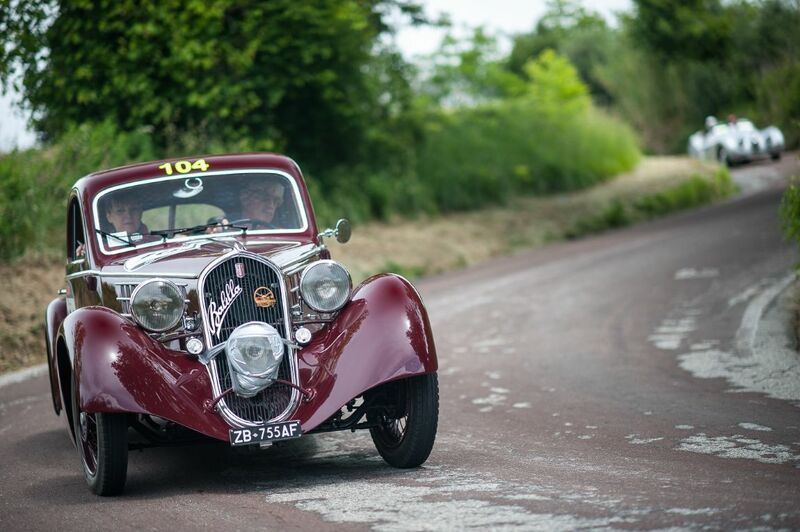 The 2014 race featured changes in the program and course: the Mille Miglia lasted an extra day, adding a 4th leg on Sunday morning. In addition to the traditional start and finish in Brescia, with the half-way mark in Rome, the 1st leg finished in Padova, with an overnight stay in Thermae Abano Montegrotto; the 3rd leg took the race to Bologna. Other places on the route included Riccione, Loreto, Ascoli, Teramo, L’Aquila, Volterra, Lucca and Pisa. Another change for the 2014 Mille Miglia was the the number of time trials, rising to 74, that went towards the final ranking. After absence of over a decade, the course also included six pre-defined average speed navigation trials. This type of trial – in which drivers must maintain a constant average speed – is not well-known in Italy but is common abroad. 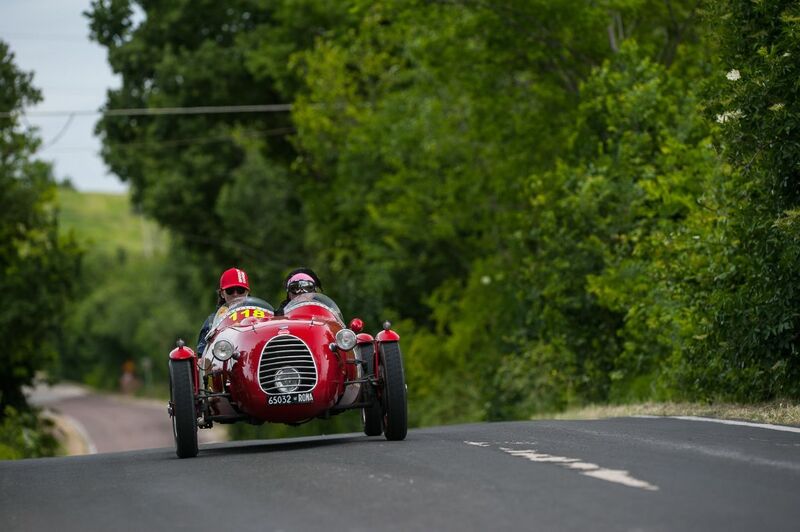 Organizers said this new challenge was to allow foreign teams, and European ones in particular, to clock up more points, as a small gesture in the spirit of the healthy competition and sporting friendship that has permeated the Mille Miglia since its beginnings. The crew of Giordano Mozzi and Stefania Biacca won the 2014 edition of the Mille Miglia in their 1928 Lancia Lambda Tipo 221 Spider Ca.Sa.Ro with points totaling 45,772. Alessandro Gamberini and Mirco Magni finished second in their 1930 Alfa Romeo 6C 1750 Gran Sport Zagato, 1,523 points behind, while the 1933 Aston Martin Le Mans of Giovanni Moceri and Tiberio Cavalleri came in third for the third consecutive year. Yet in the end, the Italian teams dominated the standings, taking 14 out of the top 20 and the podium. 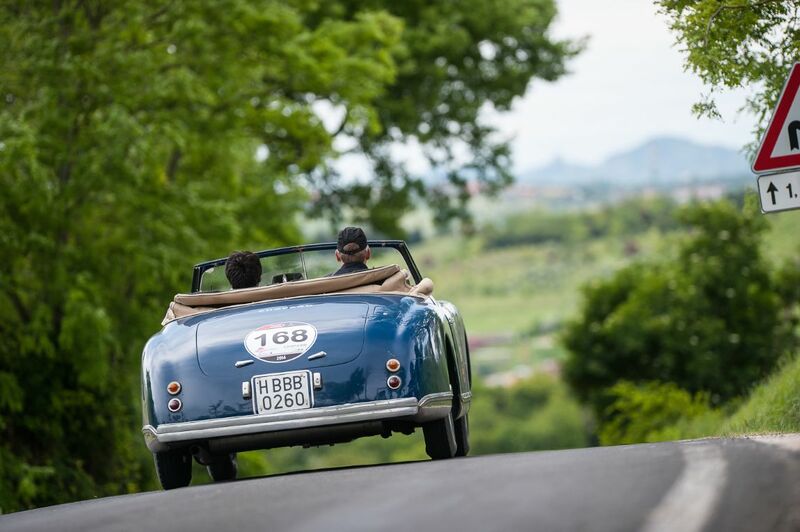 Similar to 2013, photographer Julien Mahiels also documented the 2014 Mille Miglia Rally, offering the following stunning picture gallery that highlight the interesting field of entrants and the charming Italian landscapes. We split up Julien’s pictures into two galleries. The first gallery starting below features our favorite images, all displayed in the full-width view of Sports Car Digest, while the second gallery and rally results can be found on the last page of the article and gives a comprehensive view of all the photographs. To see more from Julien, visit julienmahiels.net. Remarkable images Julien! Love the diversity of cars and the backdrops. is in fact a late forties Riley powered Healey Westland. Thanks. The green car you ask to identify above is in fact a 1947 Healey Duncan Drone, the actual car that competed in 1949 and crashed, killing one and seriously injuring another. Restored and driven now by Warren Kennedy. Big thanks Chris! We’ve updated both entries. Not a single photo of one of the 2 Porsche 550 Spyder entries ?? They will be in the next gallery ! Thank you, thank you, thank you for making my day with these photos. Absolutely superb – well done! The “unidentified” green car is a 1947 Healy Duncan Drone. And by the way: the first Alfa Romeo is a Healy 2400 Westland. Maurice, we have already identified those; see above, thanks. 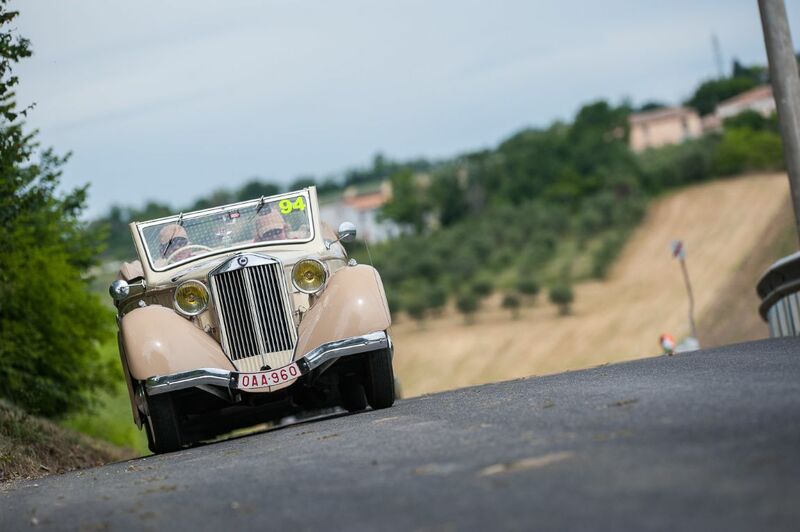 The fine work of your committee in organizing a successful 2014 Mille Miglia deserves a tribute, a salute and an observation about recent years past. 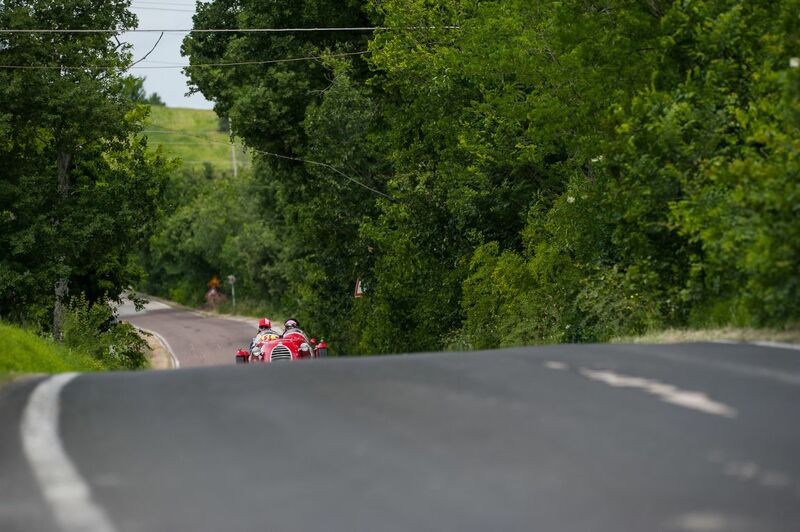 I have personally raced and followed the course of the Mille Miglia three years now…2011, 2012 and 2014 and consider myself a well-informed observer and probably the American with the most personal experience with the Mille Miglia in recent years. In a well-circulated American auto enthusiast blog in May of 2012 I wrote of the “Germanization” of the Mille Miglia in 2012 and how I felt that 15 Mercedes Benz 300SLs, a dozen or so BMW 328s, a constant visual barrage of the three-pointed star and BMW’s familiar ‘propeller’ logos, not to mention the 50,000 waving Mercedes-Benz flags passed out along the circuit, the preponderance of Mercedes-Benz and BMW banners and car exhibits…..and the out and out the belligerence of the menacing German manufacturer Support Cars …and the collective impression that the Germans had ‘bought’ the Mille Miglia. You responded to my remarks in partial defense of this display and commented that I would be delighted to see changes made to the 2013 Mille Miglia and should withhold judgment until then. 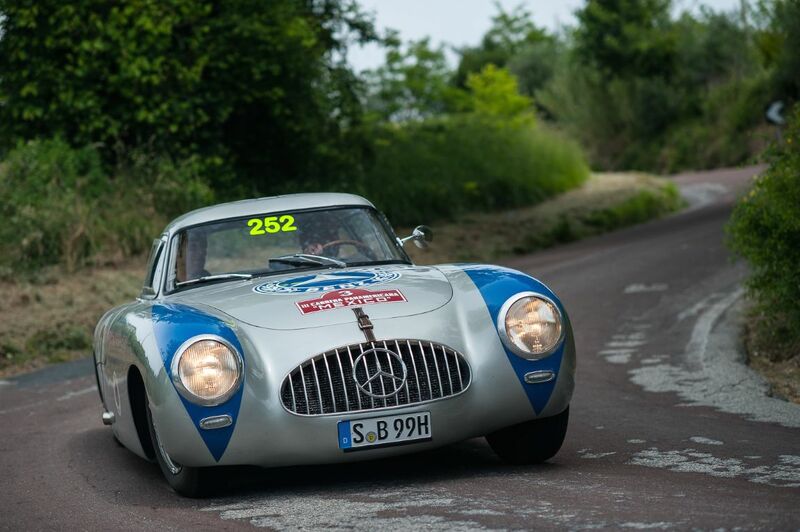 I chose not to attend in 2013 for personal reasons but I did race the course with the 431 entrants this year as a member of the media and I am pleased to say that your committee has corrected the overall net impression that the “Mercedes-Benz Mille Miglia” (a.k.a “MBMM”) of 2012 had in fact been returned to a more normal, fair and balanced “Internationalization”. Understanding that a huge amount of money had been pledged by Mercedes-Benz to lead the sponsorship of the event…and that other manufacturers and sponsors had passed on their opportunity to sponsor the event themselves… I feel you have successfully controlled the arrogance of the German manufacturers and generally returned the event to that of a world-class event supported by a wider class of sponsors who did not attempt to overpower each other with their respective messages throughout the 1100 miles of the race. In part, you were responsive to those who agreed with me. You faced fiscal realities involved in controlling and balancing competing sponsorship messages. I was particularity gratified to see that Alfa Romeo had stepped forward to become a major sponsor…instead of a more remote and distant participant. I look forward to the 2015 Mille Miglia with more confidence that your “Internationalization” message will be further applied to the event and that the parade of the German car manufacturers will be more tightly controlled for the public relations benefit of all of the marques presented. Please pass my congratulatory remarks along to your associates and committee members in Brescia. Spectacular photo coverage by Julien! The quality of the cars is matched by the quality of the coverage. Any of the images would make a gallery better. Bravo!